The event will see legal and justice sector experts, both within and outside Nigeria, discuss how the Nigerian justice system can be improved. The HiiL Justice Accelerator (HJA), a part of the Hague Institute for Innovation of Law (HiiL), will host the Lagos Justice Innovating Conference on the 21st of September 2018 at the Landmark Centre, Victoria Island, Lagos, to discuss how the justice system could be made more accessible and user-friendly, through the combination of big data, technology and innovations in Nigeria. 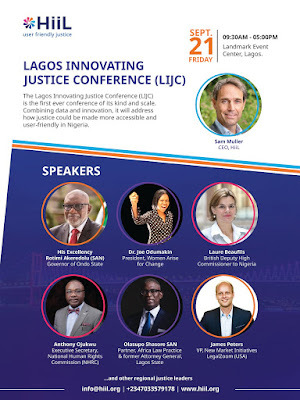 This conference is described as the biggest of its kind and caliber to take place in the country, the conference will combine data and innovation to not only figure out ways to improve Nigeria's justice system but also tackle making justice more friendly. Speaking on the significance of the event, HiiL's CEO Sam Muller said, "The data we will share at this event on Nigerian justice needs will be a gamechanger for anyone working on justice in this country. What makes it even better: the region's best justice innovations are there too. This could be a historic moment of a new justice movement in Nigeria." Sam Muller and Vice President His Excellency, Prof. Yemi Osinbajo SAN will give the opening remarks at the event while His Excellency Rotimi Akeredolu SAN, Governor of Ondo State will give the welcome address. Asides the panel discussions, other events lined up during the conference includes the release of the Justice Needs and Satisfaction Survey (JNS), a first of its kind, massive survey of the justice needs of the average Nigerian. Also, the best Nigerian justice innovators from the 2018 Innovating Justice Challenge will pitch their innovations for a chance to win 20,000 EUR in funding from the Hague Institute for Innovation of Law. The ​HiiL Justice Accelerator​ is a part of the ​Hague Institute for Innovation of Law (HiiL)​ based in the Netherlands. The HJA scouts and supports the best justice innovators around the world in order to create justice for all. Particularly in Africa and the Middle East but also across the world, through local partners and supporters. By offering seed funding as well as follow up funds, HJA funds justice entrepreneurs with cash they need to grow their innovation. Through HJA's acceleration programmes and business services justice innovators get the right help to scale their innovations.